I love to experiment with recipes. One of my favorite things to do is make my pizza dough and have my friends come over with whatever toppings they would like to put on their pizza. This combination came from my wonderfully creative friend Sam while he was helping me study for my IPA test. Combine yeast, warm water, and sugar in a bowl. Stir slightly to combine and let sit for approximately 5 minutes until a thick layer of bubbles covers the top. In bowl or food processor with kneading blade, combine flour, salt, and any additional herbs or seasonings for dough (fresh oregano and basil are my favorites). In bowl at least 3x larger than size of dough, add the olive oil and put the ball of dough in bowl making sure all sides are covered in the olive oil. Cover with a damp towel and put in a warm place for 45 minutes. Knead again and let rise another 30 minutes. Once dough has started it's second rising, preheat oven with stone in place to 500 degrees F.
Once toppings are ready, flour your rolling surface and rolling pin. Section dough for desired size and start rolling. Spread some cornmeal onto pizza spatula or cookie sheet, add toppings, and transfer to preheated stone in oven. Reduce heat to 400 degrees F.
Depending on how thick the crust is, cook time varies. I usually have a 1/8 inch crust which usually finishes in 8-10 min. Crust should brown slightly around the edges. Also, this is a thin and crunchy crust. If you prefer a thick crust, roll out dough after it rises the first time. Then add toppings and allow 20 minutes in a warm place to rise a little before putting it in the oven. Cook time again varies but usually about 15 minutes. Cut prosciutto into 1 inch thick slices. Chop onion and carmelize in pan with butter or olive oil and salt. 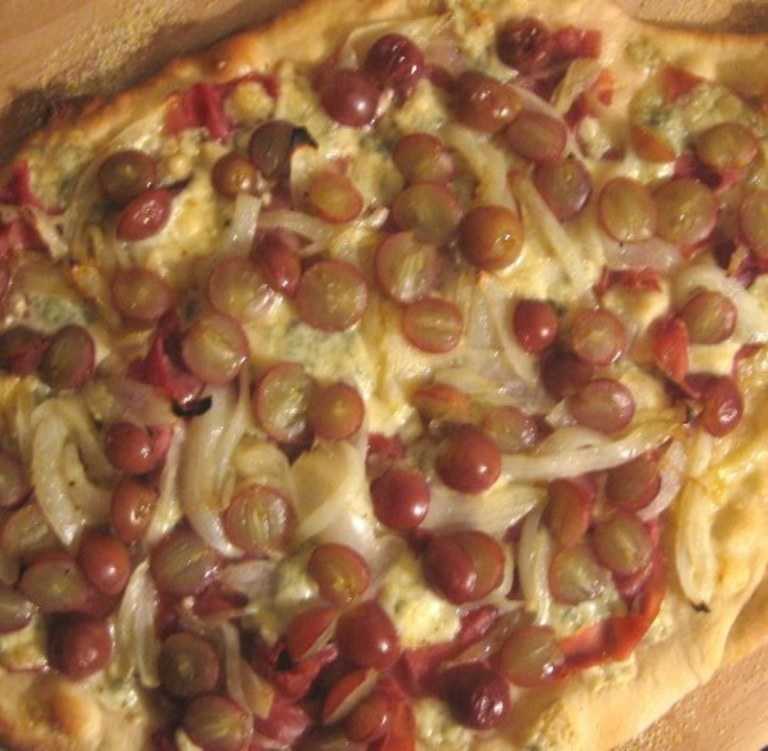 Spread onions evenly on pizza dough. Spread prosciutto evenly on top of onions. Spread grapes evenly on top of prosciutto. Crumble Gorgonzola on top of pizza. Sprinkle the arugula on top and finish with a light drizzle of olive oil.